YEREVAN, Armenia (AP) — Thousands of Armenians lined the streets of the capital Yerevan Saturday, protesting the Turkish president who drove past in the first ever visit by a Turkish leader. Many held placards demanding justice for massacres that took place nearly 100 years ago. Turkish President Abdullah Gul boards a plane at Ankara before departing on an historic visit to Armenia. Abdullah Gul arrived in Armenia to watch a Turkey vs. Armenia football World Cup qualifier game with President Serge Sarkisian that many hope will help the two countries overcome decades of antagonism rooted in Ottoman-era massacres of Armenians. Gul is the first Turkish leader to set foot in Armenia since the ex-Soviet nation declared independence in 1991. The two neighbors have no diplomatic ties and their border has been closed since 1993. Historians estimate up to 1.5 million Armenians were killed by Ottoman Turks around the time of World War I, an event widely viewed by genocide scholars as the first genocide of the 20th century. Turkey, however, denies the deaths constituted genocide, saying the toll has been inflated and those killed were victims of civil war and unrest. Ties have also suffered from Turkey’s opposition to Armenia‘s occupation of the Nagorno-Karabakh region of Azerbaijan, a close Turkish ally. Others held up names of places in Turkey from which their ancestors were forced to leave as the Ottoman Empire uprooted Armenian communities between 1915 and 1922. Little progress is expected on the genocide issue or on Nagorno-Karabakh when Gul meets Sarkisian for talks just before the game — which Turkey is favored to win. Still, the visit is a sign of a diplomatic thaw. “I hope that (the visit) will help lift the obstacles that stand in the way of rapprochement between the two peoples and contribute to regional friendship and peace,” Gul said before his departure. Gul’s decision to accept Armenia’s invitation to the match is linked to Turkey’s desire to carve out a regional peacemaker role amid tensions sparked by Russia’s invasion of neighboring Georgia. Turkey, a NATO member, has cause for alarm about how Russia’s recognition of the Georgian breakaway regions of South Ossetia and Abkhazia might inspire its own separatist Kurds, or provoke Armenia to boost support for separatists in Nagorno-Karabakh. In the wake of the Georgia conflict, Turkey proposed a regional grouping for stability in the Caucasus that would include Russia, Georgia, Azerbaijan and Armenia. “About a month ago, we all saw how conflicts that have remained unresolved threatened regional stability and peace in the Caucasus,” Gul said in reference to the Georgia crisis. Armenia is the last of Turkey‘s neighbors with whom Ankara has failed to mend ties since the end of the Cold War. Turkey has gradually improved relations with old foes such as Greece, Bulgaria and Syria. Improved ties with Armenia are likely to help lift strains on Turkey’s relations with other countries that have or plan to formally recognize the massacres as genocide. In October, a measure that would have declared the Armenian deaths as genocide in the U.S. Congress was stopped after President George W. Bush’s administration warned relations with strategic ally Turkey would be damaged. On the plane, Gul paid tribute to the Armenian president. “President Sarkisian was brave in taking the opportunity of inviting me to this game,” he said. Turkey closed its border with Armenia in 1993 during a war between Armenia and Azerbaijan, a Muslim ally of Ankara, in order to pressure Yerevan into ending the conflict. he move has hurt the economy of tiny, landlocked Armenia. Armenia’s bitter ties with Azerbaijan and Turkey have resulted in the tiny country being excluded from strategic energy pipelines that connect Azerbaijan to Turkey via Georgia. Armenians, supported by numerous scholars, claim an organized genocide was carried out in the waning years of the Ottoman Empire and are pushing for the killings to be recognized as among history’s worst atrocities. Turkey contends the 1.5 million death toll is wildly inflated. It also says the Armenians were killed or displaced in civil unrest during the chaos that surrounded the empire’s collapse. Turkey has called for the establishment of a committee of scholars to study the WWI events in a bid to improve ties, but Armenia has declined to consider this until relations are forged. With a bounce in her step and a torch stuck into her jeans back pocket, she asked: “Right, it’s more than 60 metres (200ft) deep so do you want to take the stairs or the lift? She jabbed a button and, with a groan and a creak, a huge slab slid back and let us into one of Moscow’s key Cold War nuclear bunkers. It was decked out with its own air, water and food supplies for 2,500 people, should the city have come under nuclear attack. With Russia and the West now exchanging accusations about starting a new Cold War, it seemed a good place to go, once hidden in a leafy street near the Moscow River and just off Taganskaya Square, where it linked up to the Metro station so the top brass and supplies could get in there. 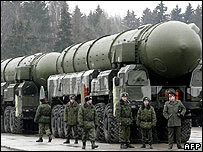 I found out later that, at the same time as our small tour group was taking the stairs down, Russia was testing an intercontinental ballistic missile from its recently modernized Topol system, more than capable of reaching Washington. Over the past couple of weeks, each day it has seemed either Russia or the West was ratcheting up the stakes, as if both sides were relieved to get away from the insoluble nihilism of Islamist terror and work on something that they could get their teeth into. Russia spoke of tensions resembling the eve of World War I. Britain’s Foreign Secretary David Miliband said that this international crisis marked a clear end to the relative calm enjoyed by Europe since the Cold War finished. But it has been difficult to reconcile this exchange of apprehensions with snapshots here, where the bus stops are decorated with posters for the new Batman movie, hoardings advertise global brand-name products and you sweep out of a ring-road tunnel towards a skyline of cranes putting up new high-rise office blocks to keep up with Russia’s high economic growth. From the mobile phones, to the makes of cars, to the news-stand Russian editions of the celebrity magazine Hello!, it is pretty impossible to envisage how a new Cold War would actually work. Boeing, for example, has a huge factory outside Moscow. Russia’s Gazprom, the conglomerate much feared for its ability to turn on and off Europe’s gas supplies, is one of the biggest companies listed on international stock exchanges. And would some Western package of punitive sanctions mean that the Russian billionaire Roman Abramovich would have to sell Chelsea Football Club? In the last Cold War, Russians were seen as isolated behind their Iron Curtain, with their own ropey technology and a grim-faced population oppressed by secretive monosyllabic leaders. Now you can barely stop them talking, as they ferry between 24-hour news channel chat shows. 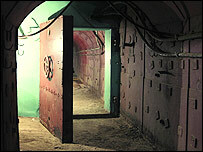 As we finished our climb down the stairs, Evgenia snapped on the lights to the bunker. It was a complex network of narrow tunnels that broke out into vast, high-ceilinged chambers with the sides curved cylindrically like the hull of a ship, made of reinforced lead and concrete. The museum had put in telex machines, old telephones, maps and wooden desks to show what it had looked like. Evgenia ushered us into a lecture hall for a video briefing, where I got perhaps a glimpse of Russia’s present-day thinking. Black and white film drawn from once-classified Soviet archives began by naming America as the only nation that had ever used a nuclear weapon in conflict, and telling how the Soviet Union was forced to catch up to protect what it called its “sphere of influence”. The 1962 Cuban missile conflict was a brilliant piece of brinkmanship that re-defined Russia’s global power. The collapse of the Soviet Union was a tragedy. The motif of the film was nuclear tests, exploding into bigger and bigger mushroom clouds, both Russian and American. She pushed back her dark hair and creased her brow in confusion. She would have only been a child when the last one ended. 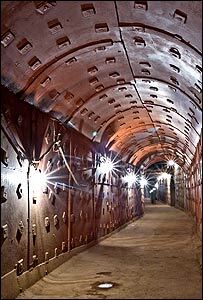 “But it’s no longer safe down here from a nuclear attack, you know. The bombs are too big now. It’s not deep enough. “We have new bunkers in Moscow, though. Maybe 100 metres deep, I don’t know. Barack Obama has a hard act to follow at this convention: himself. Four years ago, when Democrats gathered for their national convention in Boston to nominate John Kerry, the then-US Senate candidate made a much-lauded, career-defining speech. His message of a unified America, coming from the mouth of a young, mixed-race politician, marked the effective launch of the history-making Obama phenomenon. It also brings a level of expectation ahead of his speech on Thursday, which the last Democratic candidate, who went on to become president, did not have to face. When nominee Bill Clinton spoke at the 1992 Convention in New York, it was four years after he had made a convention speech that was widely seen (including by Clinton, himself) as rather long-winded and boring. He did not repeat his mistake. With his “I still believe in a place called Hope” speech, the Arkansas governor defined himself in a way that resonated with the country at large. Barack Obama needs to do something similar. With opinion polls placing him in a tight race with Republican John McCain and suggesting that sections of the public still do not have a clear impression of who he is, his goal is to come out of the week having defined himself as someone whom Americans can feel comfortable about as a leader. He needs to sell his vision, his experience and his unconventional background. He will be selling that vision of himself on an auspicious date: the 45th anniversary of Martin Luther King Jr’s “I have a dream” speech. But, while that may add to the weight of history on his shoulders, the location of his speech represents a break with history. Obama will not accept the nomination in the Convention Hall, but at the 70,000-seater Invesco Field, home of the Denver Broncos Football team. This will provide a unique spectacle, but it also presents a certain danger of perception for a candidate who – since securing the Democratic nomination in June – has faced accusations of being too presumptuous about his chances of winning the November election. And while the 1992 Clinton experience offers him a something of a blueprint for success, the 2008 Clinton presence, on the other hand, presents him with potential pitfalls. Both Hillary and Bill Clinton will be speaking at the Convention. Their performances – on Tuesday and Wednesday respectively – will be watched closely for signs of party disunity, that could harm not only Barack Obama’s chances, but those of Democrats running for Congress in November. 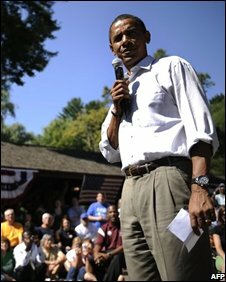 Despite a joint appearance with Senator Obama in Unity, New Hampshire earlier this summer, Hillary Clinton is still dogged by questions about her level of support for the man who narrowly beat her to the nomination. Many of her supporters are still unhappy about the manner of her defeat. There is also concern that she was not seriously considered for the position of running mate, which Senator Joe Biden has secured. By allowing Senator Clinton’s delegates to participate in a formal nominating roll call vote – recognising the historical nature of her campaign – the Obama team hopes to defuse some of the remaining tensions and shore up the support of the millions who voted for the former First Lady. Neither outcome is a foregone conclusion. John McCain’s campaign is doing its mischievous best to stir things up: releasing an advert, showing Hillary Clinton asking some of the same questions about Barack Obama’s experience and judgment during the primary campaign which they are asking now. 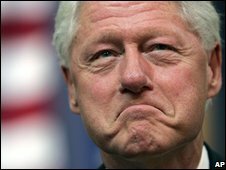 But, perhaps, it is Bill Clinton’s speech that will be the most closely dissected; both for its words and for the body language of the man delivering it. 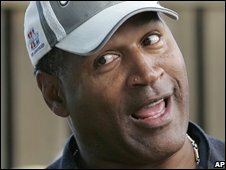 By his silence, the former president has given the impression that he is still sulking about Obama’s victory over his wife. Many Convention-goers will be looking for him to swallow his pride and give the sort of full-throated endorsement of the party’s nominee, that will sway Democrats flirting with John McCain, and help to repair some of the damage done to President Clinton’s own reputation during the primaries. As he effectively hands over the role of party leader to a younger man, he can still play the role of party healer. How to measure the success of this? The time-honoured tradition has been to look at the “convention bounce” – the boost in the opinion polls which a candidate gains from his moment engulfed in balloons and ticker tape. Bill Clinton, for example, got one in 1992 and never relinquished his lead over George H W Bush. Time is not Barack Obama’s side, though. No sooner has the Democratic Convention finished, than the Republicans meet in St Paul, Minnesota. So the onus is on Senator Obama to make the most of his time in the spotlight, before the spotlight quickly turns to his Republican rival, John McCain. 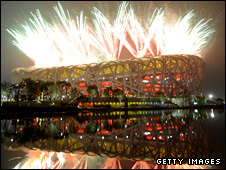 The Beijing Games draw to a close on Sunday after what many have described as one of the best Olympics ever held. China, having beaten the United States to top the medals table, will hand the Olympic flag to the 2012 hosts London at a closing ceremony from 1300 BST. 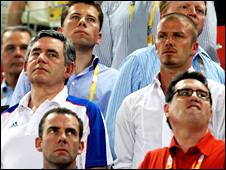 Great Britain surpassed all targets by winning 19 golds at the 2008 Games – their best haul for a century. Kenya’s Sammy Wanjiru won the men’s marathon on the final day, with basketball and boxing finals to come. Six boxing titles are being decided while the men’s basketball final, featuring the United States and Spain, starts at 0730 BST. Later, the spectacular farewell in front of a packed house of more than 90,000 at the Bird’s Nest stadium is set to last three hours and will include fireworks displays at 18 locations across Beijing. The organisers have promised a more light-hearted show than the opening ceremony, which focused heavily on Chinese history. Scottish cyclist Chris Hoy, who claimed three gold medals at the Games, will carry the flag for Team GB at the closing ceremony. The ceremony will also see London mayor Boris Johnson receive the Olympic flag to signal the countdown to the 2012 Games. Team GB have been congratulated for their efforts in a message from The Queen. But the sporting action has been enthralling, with highlights including Michael Phelps swimming to a record eight gold medals and Jamaican Usain Bolt breaking three world records as he bagged a sprint title treble. British Prime Minister Gordon Brown, who spoke on Sunday of his hope that a UK football team could compete in the next Olympics, will attend the closing event. The London Olympics will also have a eight-minute slot that will feature a version of Led Zeppelin classic Whole Lotta Love performed by the group’s guitarist Jimmy Page and singer Leona Lewis.Footballer David Beckham will be involved as will the Royal Ballet and the London Symphony Orchestra. The closing show will also feature a duet by Chinese folk singer Song Zuying and Spanish tenor Placido Domingo, along with a performance by a 350-strong kung-fu group. There promises to be another spectacular show earlier in the day when the US basketball team, aka the ‘Redeem Team’, look to reclaim their crown against world champions Spain. There are also six boxing gold medals to be decided, with Ireland’s Kenny Egan going in the light-heavyweight final. Other finals are taking place in the men’s water polo (0840), men’s volleyball (0500), and men’s handball (0845). In the rhythmic gymnastics group all-around event, Russia defended their title to take gold, while China claimed silver and Belarus bronze. In total, there will be 12 gold medals won on the final day of action before the Games are handed on to London. A Chinese student who was tortured and murdered along with his girlfriend may have lied about his qualifications to get into university, police have said. 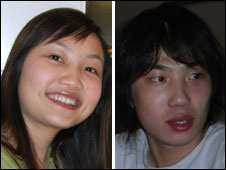 Zhen Xing Yang and girlfriend Xi Zhou died after a “frenzied” knife attack at a flat in Newcastle’s West End. Police believe the pair, both 25, were involved in a betting scam, which may have been a motive for their murders. Officers are now investigating whether Mr Zhen forged documents to enroll on a masters course at Newcastle University. Police are in telephone contact with the couple’s families and are trying to speed up Visa applications so they can come to the UK. 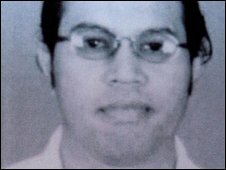 Police said Mr Zhen dropped out of a Cardiff University undergraduate degree course in 2005. A university spokesperson said: “Cardiff University can confirm that Zhen Xing Yang, born 1 February, 1983, attended Cardiff Business School from 2004-5. Mr Zhen then gained a place on a postgraduate course at Newcastle University, gaining a masters degree in 2006. Det Supt Steve Wade, leading the investigation, said: “We can confirm new evidence has been provided about Zhen Xing Yang. “It suggests he may have gained entry to his MA degree course at Newcastle University as a result of producing fraudulent documentation stating he had successfully completed an undergraduate degree. “Officers are continuing to work with Newcastle University to establish if this information is correct. One line of inquiry into the murders is that Mr Zhen recruited spectators online to send live updates from UK football matches as part of a betting scam. It is claimed syndicates in China, where matches are televised a minute behind, could take advantage of this. The couple were found dead in separate bedrooms at the downstairs flat by friends. Police said Mr Zhen was assaulted for more than an hour before being stabbed. Examinations also showed Miss Xi may have been asphyxiated as well as stabbed during the attack. A Chinese couple murdered in Newcastle may have been involved in a range of internet scams, including betting and providing false visas, police said. Detectives revealed information on a seized computer and three mobile phones showed the pair may also have arranged forged professional qualifications. The 25-year-old Newcastle University graduates, were found dead on 9 August. Det Supt Steve Wade, leading the murder investigation, said: “A possible motive for the killings is beginning to emerge concerning the lifestyle of Xi Zhou and Zhen Xing Yang. “Community intelligence supported by the examination of computer equipment and mobile call data has shown that both of the victims have been involved in fraudulent activity which has angered and upset a number of people. One line of inquiry involves claims Mr Zhen recruited spectators online to send live updates from UK football matches. Information passed to Northumbria Police includes details of adverts placed on UK-based Mandarin-language websites, recruiting people to watch football matches around the world. An ad posted under the name CICI-UK, his girlfriend’s nickname, on the powerapple website last October, reads: “Work: Watch football games and send live information to people. “Requirement: Basic understanding of football rules, no professional background needed, advantage if you have a car. 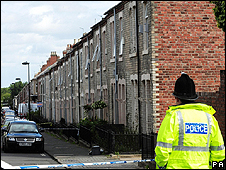 The couple were found dead in separate bedrooms at the downstairs flat by friends on the afternoon on 9 August. 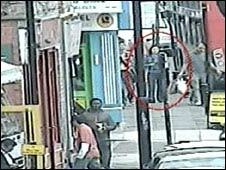 Police said Mr Zhen was “assaulted for more than an hour” before being stabbed. They believe passers-by may have heard his screams. A post-mortem examination revealed he suffered extensive bruising to his arms before he died. The body of a cat, which had been drowned and hidden in a washing bowl underneath the bathroom sink, was probably killed by the couple’s murderer, said police. An offender profiler has been brought in to help establish a motive for the killings. Police have also released CCTV images taken as Miss Xi traveled home from work at the Wagamama restaurant in Newcastle last Thursday afternoon. Police have not been able to find any occupation for Mr Zhen since he completed his degree in September 2006. A Northumbria Police spokesman said: “We continue to look into the lifestyle of both victims and internet websites form part of this investigation. If they ever do get around to trimming tennis from the Olympics, I would like to suggest a thoroughly amateur activity to take its place: competitive spectating. The game is simple: you watch as much live, in-the-flesh sport as possible within an allotted time. Like cricket, there are shorter and longer versions of the game, but unlike cricket there is no time for lunch or tea. I believe the one-day format would work best at an Olympics. It requires speed, planning and a change of shirt. I know this because I have tried it and I think I’ve set a new world record. Between 10am and 11pm on Wednesday, I rode my mate’s mountain bike (cheers Paul) to 19 different Olympic venues and saw world-class sport in 15 of them, world-class press conferences in three more and 20 Chinese volunteers pretend to be modern pentathletes in another. I covered about 50km, drank 20 bottles of water, went through three maps and met the entire judging panel from the International Federation of Associated Wrestling Styles. Perhaps the best way to tell that story, in fact, the whole story, is to start at the beginning. So I will. Like all elite athletes I think breakfast is the most important meal, so I decided to skip the fare on offer in the media village and have a slap-up feed in a decent hotel downtown – they may now be reconsidering that all-you-can-eat deal. Adequately fuelled and aboard my mode of transport, I set off from the Financial District and headed southwest for the softball. The thinking here was to start at my southernmost point and move around the city in a clockwise fashion. Having meandered my way to Fengtai, I found myself at the top of the seventh inning with China pounding Venezuela 7-1. I can’t remember much about the game mainly because I was worrying about Paul’s bike being destroyed in a controlled explosion. Because while Katie Melua may be right about there being nine million bikes in Beijing, none of them are welcome at an Olympic venue. Not if you ask for permission first, that is. I would learn that as the day progressed. From softball I rode north to Wukesong to taste two more slices of Americana, baseball and basketball. Here my arrival was not particularly well received and my gestures to say, “Can I chain my bike to this please, officer?” were met by stern shakes of the head. Perhaps they didn’t understand my gesture. Strange, I thought that one was universal. In the end I left it behind some portaloos. I’m not proud. I got into the baseball in time to see Canada’s Stubby Clapp (honestly, look him up) pop up to right field and was looking at my map when one of his team-mates blasted a three-run homer minutes later. That made it Canada 3-0 China. I then went to the basketball and watched Spain’s Anna Montanana drain a jumper for two of her 20 points in the win over the Czech Republic. From there it was northeast towards the Capital Gymnasium and a dose of clothed women’s volleyball. To be honest, even regular volleyballers don’t wear much and there was a lot of leg on display in this clash between Russia and Kazakhstan. The Russians were winning but the highlight for me was seeing Kazakh volleyball’s answer to Peter Crouch. I didn’t catch her name but she was wearing number five and you’d know her if you saw her. Four hours in and I was at the Institute of Technology to see some gymnastics – the hundreds of people heading the opposite direction should have told me I was too late. I went in anyway, though, and listened to two minutes of a Chinese press conference. As I left I heard a group of volunteers singing little ditties to each other through their megaphones. One of them might have been the girl who actually sang at the Opening Ceremony. Table tennis was next and the hardest thing here was getting in. You see the staff are only trained to deal with very specific tasks. A journalist coming in through the main entrance (and not arriving by media bus) causes the system to grind to a halt. The fact he was sweating profusely probably didn’t help either. This would become a recurring theme but competitive spectators have got to deal with these kinds of problems so I was able to overcome all this and catch eight different games of ping-pong at once. Too much of a good thing? Yes, probably. I tried to concentrate on Ma Lin’s tussle with Panagiotis Gionis of Greece and not the cute Spaniard playing on the other side of the room. It was judo next. Not much to say here except I filled my pockets with Oreo cookies in the media lounge and saw a Colombian beat an Italian in the women’s 70kg category. Six hours in and it was time to wrestle. To be honest, it was all starting to blur a bit now and the only real difference I can remember between the judo and the wrestling is the costume. And it’s a big difference. I also got lost in the bowels of the venue (I’d come in the “wrong” entrance again) and ended up in a room with 20 muscular blokes in blue blazers. They were the judges. I eventually saw Steeve (usual spelling) Guenot beat Konstantin Schneider, apparently, and he would later win gold. Good lad. I then pedalled hard past the Olympic Village and pushed on to my northernmost point, the Olympic Green Sports Cluster – archery, hockey and tennis. This is where my ride started to become a cyclo-cross event. Bikes really aren’t allowed this close to the heart of the “Green Olympics” so I was forced to park and proceed by foot. The next 30 minutes saw me show my face (very briefly) at the tennis (Nadal was winning), narrowly miss Alan Wills’ last-dart victory in the archery (I saw a Korea-Qatar match-up instead) and try to gain entrance to the Great Britain changing room at the hockey (it was locked). That was 11 venues and 10 sports in just over seven hours. I was knackered. But then I remembered Emma Pooley’s words after her silver-medal performance: “there’s no secret, you just have to make it hurt”. So I headed south to the Water Cube for swimming, wandered around the corridors under the pool for about 15 minutes and eventually sat down to watch Malta’s Madeleine Scerri win a three-woman, 100m freestyle heat. Now that’s what the Olympics are really about, Michael. From there it was a short trip to the National Indoor Stadium and an even shorter stay. It was locked. But the fencing venue was just across the road for me to bring up my dozen. Fencing, by the way, is a great sport to watch. I wish I could have stayed for longer than three minutes. 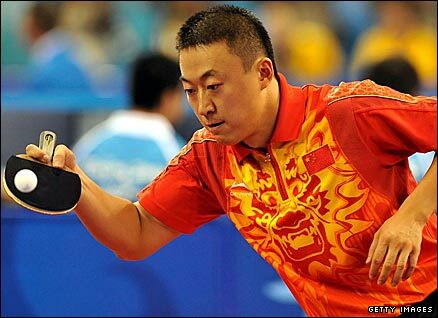 That was long enough, however, to see Yuki Ota of Japan win his semi-final and go absolutely bongo. I probably should have stopped now. It was dark and I was tired, hungry and smelly. But I wanted more and I really, really wanted to see some handball. So it was south again to the Olympic Sports Center cluster for five minutes of Norway’s demolition of Kazakhstan (I think I was bad luck for the Kazakhs all day) in the women’s event. I will definitely return if only to hear more from the American announcer who ticked off a Norwegian player for “roughhousing”. The next 30 minutes saw me just miss the last water polo game of the day and follow my ears to the modern pentathlon stadium, where Olympic volunteers were pretending to be show-jumping ponies and the stadium announcer was practising his medal ceremony script (he thinks Cuba is going to win). What happened next was an Olympic event of its own – the 20-minute time-trial to the Workers’ Stadium for the last 10 minutes of the Argentina v Serbia football match. And my lung-busting, salt-staining effort was rewarded when I flopped into a commentary position to see Diego Buonanotte curl a free-kick home from 25 yards out. Good night, indeed, Diego. This was my 18th venue, 14th sport and 12th hour. It was time for the coup de grace. Step forward, you beauty, David Price. Now is not the time to relay all that happened in the Workers’ Gymnasium at around 2200 local time but suffice it to say Team GB’s boxing captain hit the world number one from Russia harder than he had ever been hit before and he didn’t like it. Cue huge celebrations from Price and his loyal band of Scouse supporters. It was also great to see his team-mates James DeGale and Joe Murray jumping in the aisles too. So that’s the challenge. Can any of you top 15 different sports in a day? Until I hear otherwise I’m going to assume it’s a world record. I reckon it will be safe for four years at least.